Cut the sides off the peppers in fairly large pieces (3–4 per pepper) and halve the tomatoes. Lay the peppers cut side down on a grill pan covered in foil. Drizzle with olive oil and grill until the skin is blistered and blackened. Plunge in cold water and peel off the skin. Return the peppers to the grill pan, cut side up and fill each with the halved tomatoes, cut side up. Sprinkle with dried herbs, sea salt and black pepper. Grill until the tomatoes are at least partly cooked. 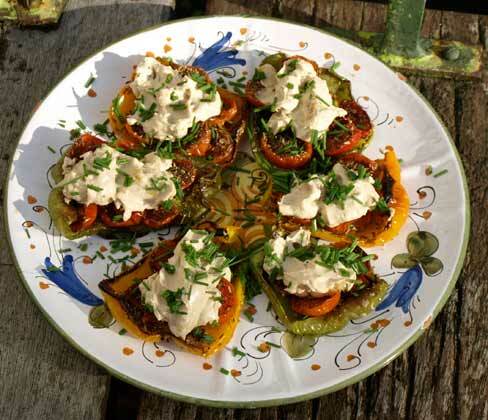 Remove from the grill, cool slightly and then cover each pepper/tomatoes with a good blob of hummus. Sprinkle with chopped chives and serve as a starter or a light salad for lunch.